…For the Peratae, the creation is the realm of nothingness and transience. Because all is subject to these characteristics, for the Peratae there is only one way to salvation: man must pass through his demise—which he cannot avoid—even before physical death. [R.S.] The above paragraphs combine two concepts: (1) passing through/crossing over—that is, transcending this material realm of “nothingness”; and (2) doing so before physical death. The former is spiritual transformation, the latter is realized eschatology. The concept περαν, “cross over,” is important to the Markan evangelist: Jesus “crosses over” the water repeatedly in the gospel, and the other canonical gospels are elaborations of the Markan patterns. 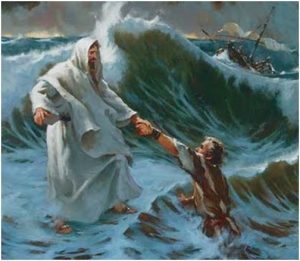 The raison d’être of those passages is clearly to introduce elements of the miraculous and the dramatic (walking on water, saving Peter from drowning, calming the storm). Yet they do not advance the story at all—Jesus never intends to go anywhere in particular (merely “to the other side,” Mk 4:35; 5:21; 8:13). Nor does he intend to do anything in particular when he gets to the other side. Without any practical reason for crossing the water, we are left only with the basic element: the crossing itself. In other words, the essence of these passages is not to be found in the plot (story-line), and the miraculous and dramatic elements are correctly seen as later embellishments added to an allegorical framework. Without those embellishments, the crossings over have no literary purpose (cf. also Mk 5:1; 6:45; 10:1). We can now conclude that the crossings of water in the Gospel of Mark (and in the other canonical gospels by analogy) have their origin in an allegorical gnostic view similar to that held by the Peratae, the Therapeutae, and Simon Magus (as examined in this and prior posts). Thus, a strong case can be made that both heterodox Christians and the Marcan evangelist were familiar with an important proto-gnostic conception: crossing over water = inner spiritual transformation. It would appear that Mark (1) suppressed this allegorical gnostic content, and (2) that he borrowed the allegory’s general narrative framework to fashion his ‘water’ scenes. Mark creatively illustrated the received allegory with miraculous and dramatic elements centered upon Jesus the Nazarene. Thus, gnostic allegory became orthodox pseudo-history. Certainly, the direction of influence was from heterodoxy to orthodoxy. The sequence is important, because the primacy of heterodoxy/gnosticism is at stake. We can infer the priority of the gnostic allegory because crossing water as an inner transformation was already known before the evangelist Mark—that is, to Philo and the Therapeutae, as we have seen. When we recall that the canonical gospels are post-Marcionite and mid-second century writings, then the conclusion becomes even more probable that Mark knew—and drew on—the proto-gnostic ‘water’ tradition shared by the Peratae, the Therapeutae, and Simon Magus. As close as I have been able to ascertain, Mark effected his vital ‘reinterpretation’ of the gnostic allegory in the decade of the 140s CE. This reinterpretation laid the foundation of Christianity as we know it. Previous to Mark’s work (that is, in the first century CE), Jesus/the Savior was a spiritual power (gnosis), the Christian religion was one of inner spiritual transformation, and the texts are in the language of gnostic allegory. The evangelist Mark, however, began a new pattern: Jesus/the Savior is a material power (the God-Man), the Christian religion is one of fealty (faith), and the texts are in the language of invented history. 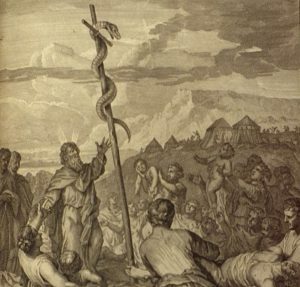 Detering adds an important consideration: “The Peratae identified the Serpent with the Logos… In the middle position, it is situated between the unmoved Father and movable matter. On the one side it turns to the Father, so as to receive His power and then pass it along to the material realm. On the other side it liberates the Father’s powers that have become entrapped in materiality and returns them to the Father, so that “at this top of (the Peratic’s) head… are setting and rising mingled one with the other” (Ref 5:16). Here, then, we have a fusion of the Indian Kundalini doctrine (discussed in the preceding post) with the Greek Logos doctrine. [Detering writes:] With this we come to the central mystery of the Peratae: baptism. For them, baptism is going down, demise [Untergang]. It is associated with water. Water and demise are synonyms with the Peratae. “But water, [the Peratic] says, is destruction; nor did the world, he says, perish by any other thing quicker than by water”—an evident allusion to the Flood (Ref 5.11). The allusion to the Flood is revealing. 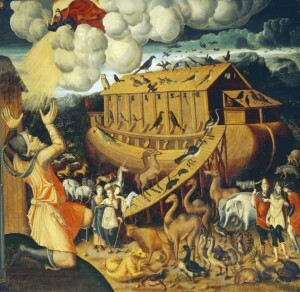 In the Genesis account of the Flood, all humanity dies with the exception of Noah and his family—attesting to the awesome destructive power of ‘water.’ However, Noah survives, and he does so based on privileged information: knowledge that the Flood is impending, and that he must build an ark without delay. Among all his contemporaries, then, for Noah water was not destructive at all. Indeed, it was water that lifted up the ark and permitted Noah and his accompanying living creatures to survive. Noah’s Ark. Italian mural painting, mid 16th century. If we now take a step back, a cosmic view of baptism emerges: for the Peratae, life itself is immersion in water. In other words, we are all subject to immersion, whether we like it or not. However, without saving gnosis, the water of life will certainly destroy us all, even as it destroyed humanity in the time of Noah, and as it destroyed the Egyptians in the Red Sea. We can now appreciate that Simon and the Peratae held a similar view. Simon considered the Red Sea to be “blood.” That is, all who are born are necessarily ‘immersed’ in the Red Sea = materiality. All must also taste of the “bitter water” of life after passing through the blood/umbilical cord. For Simon, it was “Moses—that is, the Logos—[who] altered that bitter water and made it sweet.” In other words, Moses/the Logos = gnosis. For Simon, Moses was the embodiment of the salvific “privileged information” noted above. Dr. Detering states, “For the Peratae, the creation is the realm of nothingness and transience. Because all is subject to these characteristics, for the Peratae there is only one way to salvation: man must negotiate his demise—which he cannot avoid—even before physical death.” Here we have the view of saving gnosis in this very life. That is realized eschatology. In sum, gnosis is the ‘ark’ that neutralizes the destructive power of water and that allows Noah to ride out the Flood. Transferred to the Exodus account, gnosis is the divine power that makes the water hold back. This is a critical view, one found in many Christian gnostic texts from late antiquity. Indeed, whenever we read of the water ‘going back,’ or ‘holding back,’ or ‘reversing direction’—what we are reading (in the gnostic interpretation) is nothing less than the allegorical expression of the hidden power of gnosis. It appears that the gnostics of late antiquity stretched this allegory to extremes. Consider: if the water holds back, then the river bed is exposed. Thus, an exposed river bed is shorthand for the gnostic allegory: gnosis saves, and only the possessor of gnosis makes the water hold back and exposes the dry river bed. The most astonishing elaboration of this concept is that of standing in the middle of the river! In allegorical parlance, standing on the dry river bed is like an advertisement: it is proof positive that one has made the waters pull back, and that one is thus immune to the destructive power of water. Interpreted, this means that the one who stands in the middle of the river is the hero who possesses gnosis. Of course, we find this scene already in the Old Testament (Josh 4:3 & 9). Furthermore, Moses, Joshua, and Elisha all made the water “stand still.” Can it be that the OT writers were already aware of the proto-gnostic views we have been discussing above? Finally, Simon Magus was known as “the Standing One.” The meaning of this enigmatic appellation now begins to emerge: Simon was the gnostic savior, or perhaps gnosis itself. We shall consider the epithet in more detail in a subsequent post, as well as the object which—by its very nature of incorruptibility—perfectly embodies that which endures or “stands”: the rock (cf. Peter). I wonder if even the enigmatic final of Mark 16:8 reflected the Exodus motive according to a Gnostic interpretation. The women see Jesus from a distant position just as the Pharao and the Egyptians see Moses from a distant position. 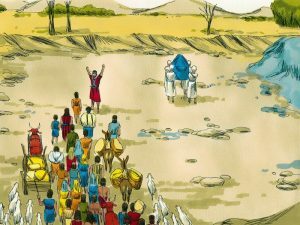 Just as the Egyptians wanted to follow Moses even in the passage of the Red Sea, so the women are so obstinate to go until to the tomb. Only a surprising event could make flee them in both the cases. Curiously, the Exodus was an allegory of the death and resurrection, according to the Gnostic Peratai and Naasseni. So, if I am correct to compare Mark 16 with the Exodus motive, the “empty tomb” would be the Red Sea, “Jerusalem” would be the land of Egypt (as per a famous apparently “historicist” verse in the Book of Revelation) while the “Galilee” would be the Promised Land. Very thanks for the your post that has inspired me in this interpretation. Interesting. I suspect that the women as the first witnesses to the resurrection may be of some historical value. I have two theories: (1) Perhaps women were the first to claim a physical resurrection for ‘Jesus,’ previously a spiritual entity (= spirit of gnosis, or simply ‘gnosis’). The idea then caught on among some men among the Jesus fellowship, and (as they say) ‘the rest is history.’ (2) There may be a tie-in with the women weeping for Tammuz (Ez 8:14). This has some force, because Tammuz (= Dumuzi = Adonis) has some suspicious associations with the figure of John the Baptist (e.g. both have the same feast day, June 24). The name Dumuzi-Abzu in Sumerian means “True Son of the Deep Water.” The god also has ancient associations with the Galilee/Mt Hermon area.